Point being, preservation work is a consummate behind-the-scenes job. On a certain level, that work should be invisible: if the goal is to return a film as close as possible to its original state, then eluding audience detection through seamless tradecraft is a mark of success. Hiding the gulf between disparate source elements and suppressing the ravages of time are laudable, essentially self-effacing, achievements. Film restoration hews closely to the physician’s Hippocratic Oath—first, do no harm. (By this standard, touting a new surround sound remix, digitally removing the intrinsic grain structure of the image, or valiantly intuiting a long-dead filmmaker’s unrealized intentions would automatically command suspicion, to say nothing of colorization, integration of new footage, and the like.) The highest compliment is not to be noticed at all. The deliberations behind a restoration are even more obscure. They are almost always private and sometimes even proprietary: convincing a foundation that a particular film is culturally auspicious enough to merit underwriting its preservation, persuading a superior to allocate scarce discretionary funds to an emergency salvage project, negotiating a fair licensing agreement with a copyright holder. These are inherently delicate situations, so it’s no surprise that they don’t often unfold in the public square. That’s why it’s novel that the preservation status of The Alamo, John Wayne’s large-scale 1960 directorial debut, has aroused so much public interest. For a film not often revived north of the Mason-Dixon line, the perilous survival of The Alamo has developed a broad, social media-abetted following. Last week a friend with no industry affiliation asked me about the ongoing woe of The Alamo at a State Street bus stop. In some sense, The Alamo deserves nothing less. It’s only appropriate that Wayne’s film leaves this world on a note of public clamor and hot tempers—a parallel to The Alamo’s scorched earth 1960/1961 Oscar campaign that birthed the cutthroat awards season template we still recognize today. Employing the same publicist who’d sold Gone with the Wind two decades earlier, Wayne waged a valiantly Crockett-esque campaign in the trade press, reminding the industry that The Alamo represented a distinctly American feat of epic filmmaking—in contrast to the year’s other major three-hour road shows, Spartacus and Exodus, both penned by newly unblacklisted, unrepentant comsymp Dalton Trumbo. (Fittingly, Wayne’s only other directorial effort was even more provocative: The Green Berets, a pro-Vietnam combat picture released at the height of the conflict.) Ultimately, The Alamo finagled seven Academy Award nominations, including Best Picture, but only took home a single statuette, for Best Sound. Before diving into #SavetheAlamo, some additional background is in order. 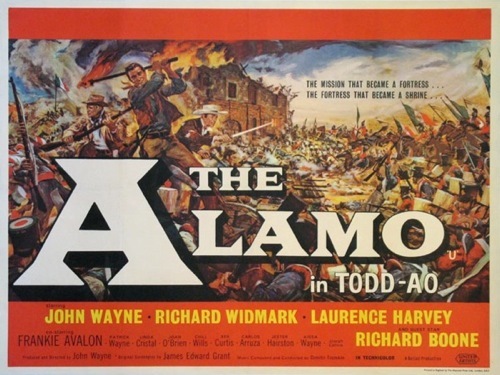 Wayne’s Alamo was an elaborate production, budgeted at an astronomical $12 million and photographed in large-format Todd-AO. Through distributor United Artists, The Alamo saw road show bookings in 70mm, but was eventually delivered to general audiences in a shortened 35mm version. The original version—192 minutes, plus overture, entr’acte, and exit music—was cut down to 161 minutes. As was customary at the time, the original 65mm negative was eventually conformed to the shorter version as well, as were the 65mm separation masters and the 35mm internegatives. The trims were discarded and most of the circulating 70mm prints were altered as well. In essence, once the short version of The Alamo was locked down, the studio made it very, very difficult to reprint or reassemble the 192-minute original cut—not out of malice, per se, but a failure of imagination. If the shorter cut meant better box office, then why would anyone ever want to make another print of that gargantuan road show version? This thinking wasn’t exclusive to United Artists—similar calculations prevailed for A Star is Born, Lawrence of Arabia, It’s a Mad, Mad, Mad, Mad World, and any number of other classics that simply proved too cumbersome for studio tastes in their original version. In the case of The Alamo, the road show version was presumed lost for three decades. In 1991, a 70mm print of the road show cut was discovered at a film warehouse in Toronto. This print served as the basis for a video transfer that was released on a letterboxed laserdisc in 1993, but otherwise the original version vanished again. The 70mm print was not used to produce new photochemical protection material or a new print. The road show version was likewise missing from the new ancillary marketplace—not available on DVD, Blu-ray, or streaming platforms. Over the last two decades, nothing has improved—for either the road show version or the general release version. 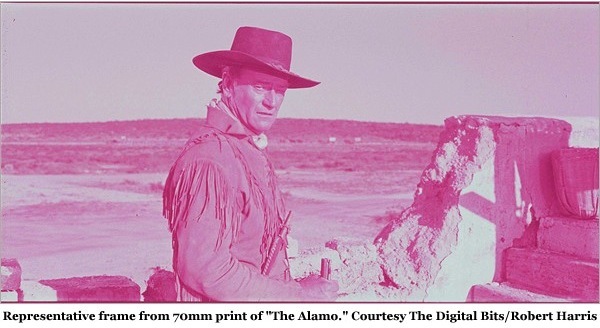 Most all of the relevant Alamo elements have deteriorated: the 65mm original negative, conformed to the short version, cannot be printed. The 65mm separation masters were improperly manufactured back in 1960 and have never been a viable source. The sole 70mm print of the road show version is now almost entirely faded, and will soon be beyond salvage due to vinegar syndrome. The 35mm internegative can still be used, but this source lacks much of the original footage, as well as the inherent resolution of the original large-format elements. Given the limitations of the surviving film elements, it’s hardly surprising that a comprehensive restoration project has failed to materialize. Even the most lavishly-funded restoration would still yield mediocre results, leaving fans complaining and donors scratching their heads. And yet the longer we wait, the worse the options become: with each year, the film elements deteriorate and a rescue job becomes less and less viable. It’s not incomprehensible that such a complicated and expensive undertaking as the restoration of The Alamo would fall through the cracks in this kind of environment. The problem is the shifting explanation for inaction. For the last five years, freelance restorationist Robert Harris (responsible for much-touted, and occasionally controversial, revamped versions of Vertigo, The Godfather, Spartacus, Rear Window, My Fair Lady, and others) has been trying to persuade MGM to properly restore The Alamo. In 2009, Harris wrote a column on the state of The Alamo for The Digital Bits, reported MGM’s support for the restoration project, and solicited donations to fully fund the endeavor. What accounts for the discrepancy? A simple misunderstanding? Conflicting definitions of preservation? Familiar Yankee treachery and deception? The Alamo now represents an exceptional situation in all respects. Public pressure is quite rare in preservation circles, where most decisions are made behind closed doors. It’s the last resort in seemingly intractable situations—whether (successfully) shaming Kodak into developing a low-fade color print stock or (fruitlessly) pushing George Lucas to restore the theatrical versions of the original Star Wars trilogy. #SavetheAlamo is unique insofar as the studio claims that the restoration work is unnecessary and redundant in the first place. (At least Lucas claimed that the original version of Star Wars was irretrievably lost and he wanted it that way, thank you very much.) It’s also notable that most of the information, if not the agitation, is coming from Harris—a contractor who has essentially appealed a rejected project bid to the court of public opinion. Suffice it to say, full-time preservationists working at, say, the Academy Film Archive or the Museum of Modern Art don’t have this option when a beloved project goes south. The knottier issue arises from what we mean when we say that a film is “not in danger of being lost.” So long as MGM has some printable 35mm element for The Alamo, this is technically true. Do they have an obligation to preserve the best version of The Alamo, rather than a version of The Alamo? Must every variant version be preserved as well? Where does it end, especially in today’s age of Director’s Cuts, Ultimate Cuts, and Extended Editions? This is scarcely an academic question. For many years, scholar William K. Everson lamented that although Herbert Brenon’s A Kiss for Cinderella had been pre- served, a reputable archive sat idle while a beautifully tinted version rotted in their collection.The other surviving copies failed to convey the full quality of the original. So was A Kiss for Cinderella lost, preserved, or something in between? Subpar restorations sometimes represent an indifferent end game, other times a necessary stop gap. 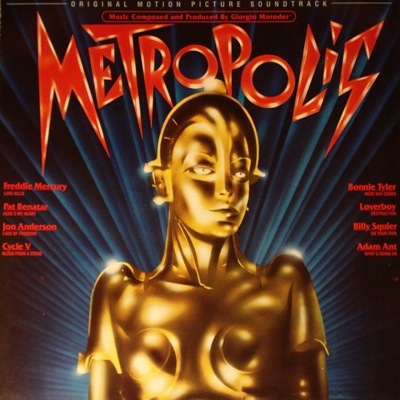 Consider the case of Metropolis, where there’s a direct lineage connecting Giorgio Moroder’s 1984 MTV-inflected revamp to the 2002 reconstruction which substituted descriptive title cards for missing footage to the 2010 restoration which incorporated roughly half an hour of footage from a 16mm negative found in Argentina. Some show of faith by MGM on The Alamo—basic preservation work now that could make a more comprehensive overhaul possible later—would obviously help matters immensely. Can MGM simply not afford to do the necessary work? Although they’ve had great difficulties over the past decade, their intellectual property portfolio has effectively resurrected the company. To wit, MGM’s immensely profitable stake in The Hobbit: An Unexpected Journey and Skyfall allowed them to contemplate a post-bankruptcy IPO last year, with analysts predicting an opening price of $70 a share. If any studio understands the bottom-line importance of catalog assets, it’s MGM. Surely MGM can reap some income from The Alamo: selling DVD and Blu-ray editions, licensing it as part of cable television package, leasing streaming and VOD rights, booking theatrical screenings. Stubbornly, though, we must pose a modified version of our earlier question: do they need the best version to see a return on investment or can they get by simply licensing a version of The Alamo? Will Amazon Instant Video reject MGM’s digital master because it’s not the road show edition, or because it’s not derived from a 4K or 8K scan? (Indeed, the unrestored, general release version is available for streaming on Amazon right now for a $2.99 rental or a $9.99 purchase.) 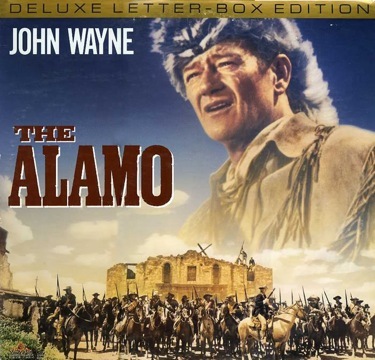 Can the market even reward MGM for producing an improved version of The Alamo when we’re moving away from physical media sales (which provided a crude vote-your-wallet barometer on individual titles) to a paradigm based on packaging hundreds or thousands of titles together for streaming agreements? There’s also another long-term threat to catalog salability—and by extension, studio-sponsored preservation and restoration—aimed directly at MGM right now. Soon enough, its implications will be felt throughout the industry. It’s Petrella v. Metro-Goldwyn-Mayer, Inc., the Supreme Court decision handed down last month. Stated simply, Petrella removes a major legal tactic from the studio roster when it comes to defending itself against copyright infringement claims. Contrary to a Ninth Circuit Court of Appeals ruling, the Supreme Court found that, the doctrine of laches—or unreasonable delay, prejudicial to the defendant—is not sufficient in itself to dismiss copyright suits. Frank Petrella died in 1981, during the initial terms of the copyrights in the screenplays and book. As this Court’s decision in Stewart confirmed, Frank Petrella’s renewal rights reverted to his heirs, who could renew the copyrights unburdened by any assignment previously made by the author . . . .
Learning of this Court’s decision in Stewart, [Petrella’s daughter, Paula] Petrella engaged an attorney who, in 1991, renewed the copyright in the 1963 screenplay. Because the copyrights in the 1973 screenplay and the 1970 book were not timely renewed, the infringement claims in this case rest exclusively on the screenplay registered in 1963. Petrella is now sole owner of the copyright in that work. Petrella’s attorney alerted MGM, subsequent owner of UA and Raging Bull, to his client’s claim to the screenplay in 1998. MGM variously ignored or denied the claim. Petrella finally filed suit in 2009—29 years after the release of the film, 18 years after the renewal of the screenplay, and 11 years after the initial complaint. MGM’s argument—that Petrella simply waited too long to file suit, depriving the defendant of access to key documents, witnesses, and other evidence—was found insufficient. Anyone familiar with Raging Bull will find this turn of events odd, as the gestation of the project is nearly as famous as the movie itself. 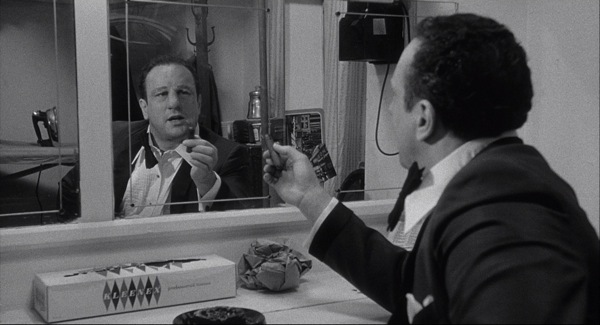 The idea began with Robert De Niro, who read LaMotta’s 1970 autobiography during a film shoot; he found the writing weak but the subject compelling. De Niro repeatedly pushed Martin Scorsese to make a film out of the book, a request to which he finally acquiesced after several years. Scorsese associate Mardik Martin was commissioned to write the screenplay. UA rejected Martin’s script, which led Scorsese to hire Paul Schrader to undertake a rewrite. Schrader’s draft added several important incidents and characters, but still wasn’t entirely satisfactory. 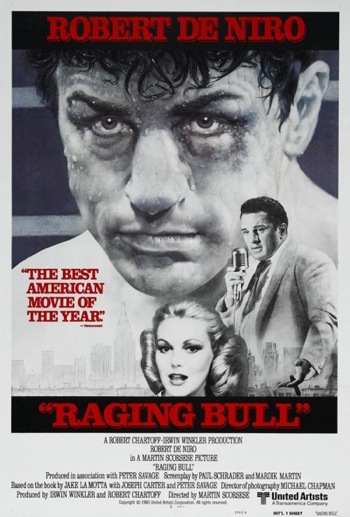 Ultimately, Scorsese and De Niro made another pass at the screenplay themselves, holing up for two and a half weeks and coming away with something that more or less resembles Raging Bull. The film itself credits Martin and Schrader (but not Scorsese or De Niro) for the screenplay. The official credits also cite LaMotta’s 1970 book, but not Petrella’s 1963 screenplay. Whether Martin, Scorsese, or anybody else even consulted this early draft or simply started from scratch is unclear. It would hardly be uncommon for a studio to acquire rights to all iterations of a story to cover their bases and protect against future claims of infringement. Obviously, the opposite happened in this case: a screenplay with a potentially tenuous connection to a film produced 17 years later is now the basis of an infringement suit, even though the studio thought they owned the script in perpetuity. Petrella may or may not wind up victorious in her claim. The Supreme Court did not reach the merits of this particular lawsuit, instead remanding the case to the Ninth Circuit with instructions to ignore MGM’s unreasonable delay argument. Even if Petrella’s claim of infringement is ultimately judged frivolous, the damage has already been done: studios cannot plead unreasonable delay when a litigant brings a decades-old copyright infringement claim to court. How many will now come out of the woodwork to claim a piece of the popular chestnuts? Because any company that uses a work for many years might now be sued decades after the first use, businesses need to have good document retention systems and keep files related to each creative work or artist. They should paper all aspects of creation and production, including taking notes, making records of meetings, and retaining drafts showing the creative process . . . . [I]f any claims or threats are received over time, they should be kept in the work’s file even if the claimant takes no action. That way, the business people twenty years later can undertake a risk/reward analysis before they put resources into marketing a re-release or anniversary edition of a work. This is a victory for artist’s rights, but a potentially catastrophic development for the preservation field. As The Alamo demonstrates, it’s already difficult enough to persuade a corporation to invest in the preservation of its own asset library. If bringing out a restored version of a film opens the door to litigation, very, very few titles would merit the risk. Would streaming deals be anywhere near as lucrative if every title could come under a cloud of legal wrangling at any time without warning? Films, especially Hollywood films, are ultimately business propositions—speculative ventures and commercial products that also happen to carry considerable artistic, cultural, and historical weight. If a corporation created a film, perhaps it’s also the corporation’s right to let it disappear. Yet such an unsentimental fate sounds disturbing and disappointing to us—if a film is capable of transcending its commercial origins through craft and insight, shouldn’t its long-term survival likewise transcend the whims of the shareholders? The market has failed, but we cannot simply leave it at that. Robust public funding for non-profit archives and exhibitors becomes essential—not only to fill in the cracks, but to point towards a different paradigm. This entry was posted in Blog and tagged Editorials, Restorations. Bookmark the permalink.